I'm ba-aaack! Thought I'd need a little more time off blogging, but screen time isn't really bothering me anymore if it's farther from my face (TV or laptop). I'm back biking again as well, still taking it easy, but I rarely get the nausea/headache motion sickness feeling unless I'm going quite fast. It's been amazing to finally start biking home from school with Linny his own little bike. He loves to ride & has become really confident in such a short time. I do still get tired & overwhelmed more easily than normal. That feeling of being a bit stressed & busy to the point I can barely focus & think straight is something I only used to feel when I was, say, sleep deprived from decorating a birthday cake til 1am, in the middle of my kid's birthday party with 35 guests. So I'm trying to limit the meetings, appointments, & social events that I go to. I also try to have at least a couple of hours doing something relaxing like colouring, listening to podcasts each day. A lot of the concussion issues seem to have cleared up, but I'm not 100% yet. Happy to be back blogging again though. 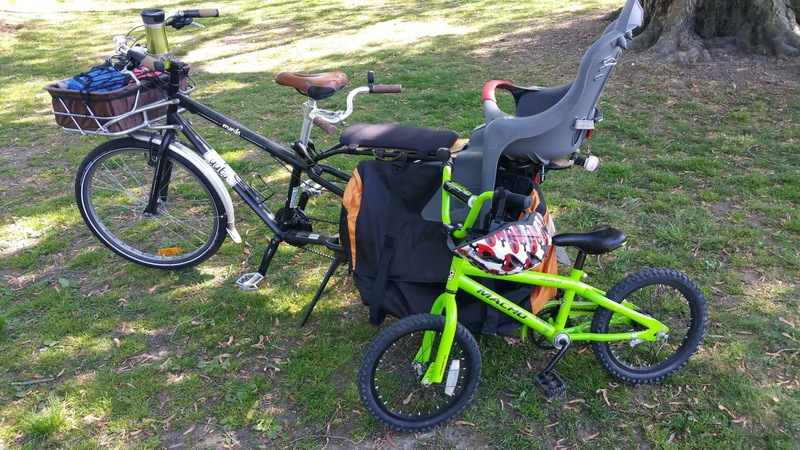 I have a lot of things to catch up on, including several reviews: Clug bike racks, Leaf health tracker, two new Blue Orange games--Dr. Eureka & Flip It, plus the pile of interviews with biking families that I've collected. Watch this space for some exciting stuff!